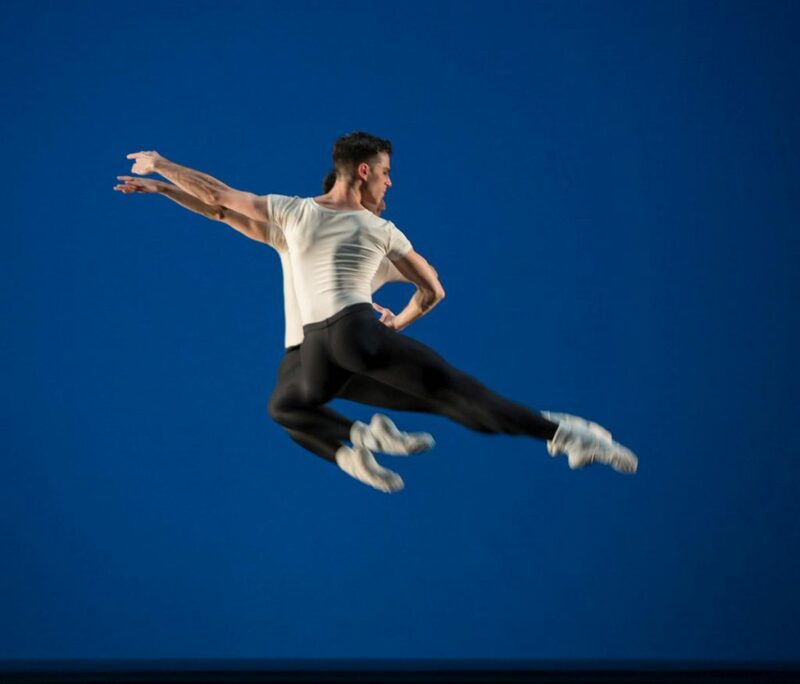 Schläpfer names his ballet programs numerically – and with his latest, which premiered in mid-December, he reached “b.33”. It was a triple bill – a recurring and well-established format in Düsseldorf – with a tried and tested combination of choreographers: Balanchine, Schläpfer, and Hans van Manen. Specifically, Balanchine’s “Stravinsky Violin Concerto” and van Manen’s “Polish Pieces” were added to the already considerable repertoire the company dances from both choreographers. The middle piece, “Roses of Shadow”, was a new creation by Schläpfer. Balanchine tackled “Stravinsky’s Violin Concerto” for the first time in 1941, choreographing “Balustrade”, which had surrealist scenery and costumes by Pavel Tchelitchev and starred Tamara Toumanouva. In 1972, one year after the composer’s death, Balanchine revisited the score and choreographed a second version: “Stravinsky Violin Concerto”. It was one of thirty ballets danced to Stravinsky’s music in New York City’s Stravinsky Festival that year. Costumes were stripped down to plain black and white practice clothes. The set was a minimalistic, blue-lit backdrop. Stravinsky’s music contrasts two arias of brooding, longing, and conflict with a playful, forward-moving frame, whose unconventional shifts embellish its high spirits. The instruments seemed engaged in cheerful chatter with brisk and witty, if sometimes odd comments flying back and forth and enhancing the communication. In the middle section – two arias – more serious topics were touched, but by the end, buoyant togetherness was restored. The group dances captured the playful and dynamic mood. Many of the dance patterns were symmetrical or mirror-imaged. Classical poses mingled with unorthodox and teasingly showy ones. Dancers pranced and scurried, flexing their feet while curving their hips sideways, and circled their arms through the air as if attempting to catch invisible balls. At times, arms were folded in front of chests, as in Russian folk dances. For the two arias, Balanchine choreographed two pas de deux. In the first, danced by Aleksandra Liashenko and Eric White, the former was ever so slightly dominant. As they twisted around each other, Liashenko’s leg rested on White’s collar bone, chest, or upper arm. Even when she was splayed on all fours, revolving around herself, either arching up her crotch or her bottom, she didn’t seem suggestive, but instead acrobatic. Her movements seemed to stir a protective impulse in White. At the end of the duet, White flung himself onto his back in front of Liashenko’s feet. In the second pas de deux, Claudine Schoch and Marcos Menha portrayed a couple with an emotionally charged relationship. At one point, Schoch knelt on the floor, her arm reaching yearningly for Menha, who stood diagonally behind her. Though he seemed to be on the verge of impulsively respond to the gesture, Menha instead hesitated briefly, as if embarrassed, and then approached Schoch and gallantly offered his hand. Once again, the partnering was inventive: Menha held Schoch’s knees together, or supported the thigh of her bent leg while she turned. In the final scene, Menha covered Schoch’s eyes from behind and gently led her in a back bend while himself kneeling down. The first section of the group dances played with various groupings of five. One man enticed a line of four women onstage; one woman in black tights was accompanied by four women in white ones; four men built a mini-corps for another male soloist. When the curtain rose, two pairs of men flanked one tall woman, standing motionless. In their prissy black pants, white shirts, slippers, and socks, towered over by the woman, the men looked like dance students next to their ballet mistress at a graduation performance. “Stravinsky Violin Concerto” merges dance and music int something bigger than the sum of its parts. 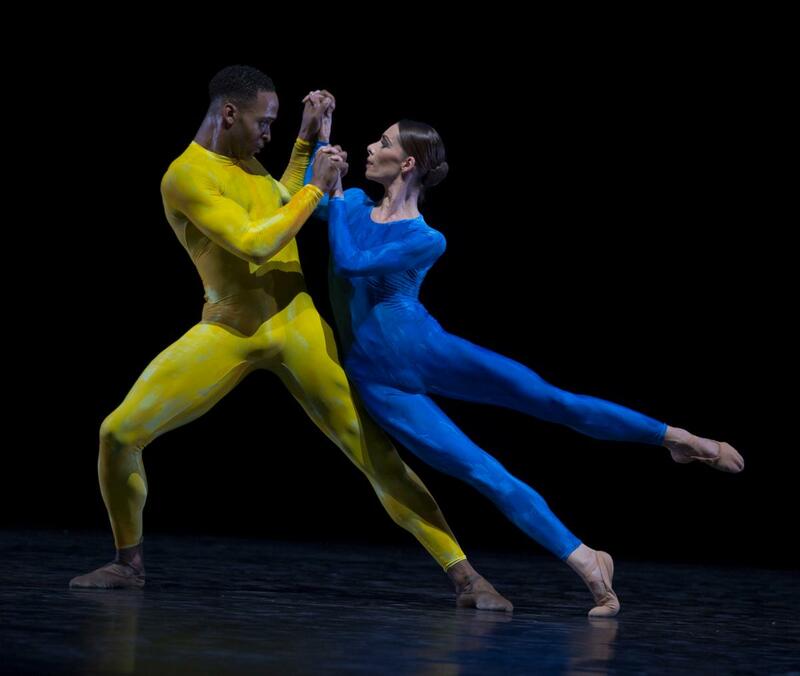 Describing van Manen’s engagement with music, the late German dance critic Jochen Schmidt said that van Manen’s choreography portrays the music’s inner tension and relates to its spirit rather than tracing its outer lines. The music for “Polish Dances”, danced with choreography from 1995 for Nederlands Dans Theater, is by Polish composer Henryk M. Górecki: “Three Pieces in Old Style” from 1963 and “Concert for Harpsichord (or Piano) and String Orchestra, op. 40” from 1990. The first of the “Three Pieces in Old Style” is a melancholic adagio, the second in an unrelenting battery of repetitive staccato bursts on the violin, and the third is a slow lament that evokes a mood of farewell. The music lasts for nine minutes in total. The Concert op. 40 is approximately the same length. In its first movement, waves of monotonous violin sounds seem to surge towards (or herald) an imminent tragedy. It seems as if the air is about to burn. In the second movement, the piano and violin alternate with cascades of sound, as if competing to outdo or outwit the other. 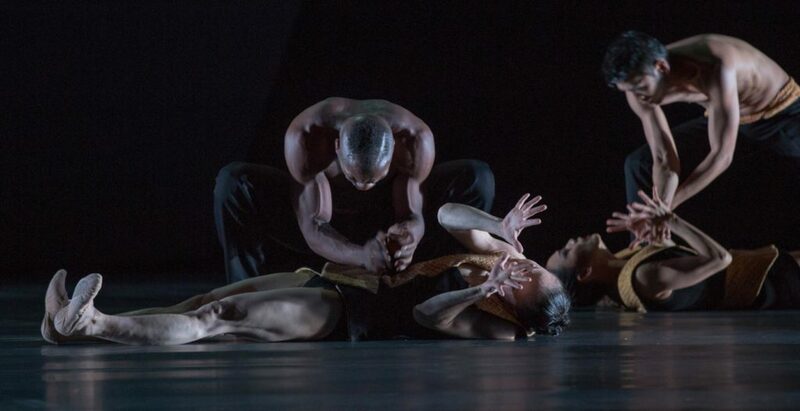 The music’s fiery energy provides the momentum for the dancers’ bodies. Their moves appear sleek, but are fueled by immeasurable power from within. Holding their hands on the upper sides of their thighs, they walk back and forth in precise lines or hop side to side while maintaining pliés in second position. Men and women circle around each other, challenging each other, at times gathering together, at others building male/female couples. Throughout the work, arms vigorously reached upwards or towards hips, which could frequently be seen swaying from side to side. Keso Dekker’s shiny and brightly-colored full-body leotards were striking in front of an entirely black backdrop. Women wore shades of blue, gray, and mauve, while men were costumed in red, brown-red, and yellow. Simply placing partners next to one another created eye-catching combinations of colors. In one pas de deux, Sonia Dvořák (wearing bright blue) lay her hand daringly close to the crotch of Philip Handschin (wearing strawberry red) and wriggled herself down his back. Seemingly indignant at this brazen advances, Handschin turned away from the audience, but still occasionally glanced at Dvořák. Later, both held each other’s hands as if comparing their strengths in a wrestling match. Exhausted, possibly by the tension of their relationship, both finally rested their heads on each other’s shoulder, crouching down and slipping to the floor. In a second pas de deux, Rashaen Arts (wearing lemon yellow) strode sideways onto the stage like a crab. Julie Thirault (wearing blue) joined him, but was uninterested and dismissive. Still, Arts grabbed her, lifted her, and positioned her like a piece of furniture. Moments later, he stood behind her, waggling like a dancing bee or, later, holding her between his knees. At the end, Dvořák simply walked off, leaving Arts standing alone onstage. For “Roses of Shadow”, Schläpfer commissioned music from the Romanian-born German composer Adriana Hölszky. It was their second collaboration after “Deep Field” in 2014. I haven’t seen “Deep Field”, but learned from the program booklet of “b.33” that its music was a comprehensive sound universe that involved an orchestra in the pit, a large choir in the upper tier, and electronic sounds from various loudspeakers. For the new piece, Schläpfer asked for the opposite: live music played by a small ensemble. Hölszky provided one soprano singer (Angelika Luz), eight musicians, and twelve different instruments: piano, percussion, viola and violoncello, koto and bass-koto, clarinet, trumpet, euphonium, alphorn, mouthorgan, and accordion. Her composition has the same title as the ballet and was inspired by two words in Shakespeare’s 67th sonnet: “roses” and “shadow”. Interested in the world hovering between life and death, Hölszky composed music representing seven stages of decay, interspersed with spoken interludes drawn from poems and text by Native Americans. Taken out of context, these lines were puzzling: “I’m born free. Free like the eagle that hovers across the huge, blue sky”*, “Walk around the mountain! Walk silently!”* or “And the mountain becomes a crystal.”*. Luz spoke these lines with a gnomish or snake-like hissing voice. In between phrases, she warbled, whooped and ranted hysterically. The instrumental cacophony beneath might have been fit to accompany a comedic film about trolls with all its gnarling and banging. The drum-rolls and the snippets of animal and everyday sounds intensified over the course of the piece. Schläpfer, who was not involved in the compositional process, choreographed for seventeen dancers onstage – nine female, eight male. 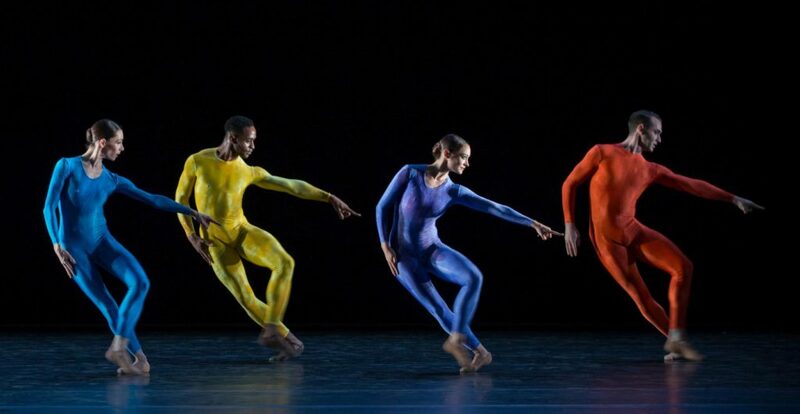 At times, he asked his dancers to visually mark out the rhythms, and at times he contrasted the spoken text by having his dancers do the opposite. For example, when at one moment the narrator’s voice announced “I’m related with the stars,”* one dancer held a yellow-black ball up in the air and carried it across the stage, while the others pointed downwards with their thumbs before suddenly throwing themselves onto the floor and paddling through imagined waters. Some scenes were memorable. At one point, the heavily muscled Chidozie Nzerem lifted the short Marlúcia do Amaral by grabbing her breasts. She was torn between longing and trying to escape. Soon afterwards, several women hung limply in the arms of the men, like corpses on a cross. In another scene, several women attempted to crawl through a corridor of legs formed by the others: inevitably they got stuck and lay contorted on the floor like dead worms. Yet, overall, the music outweighed the dance. Movement gradually slowed. 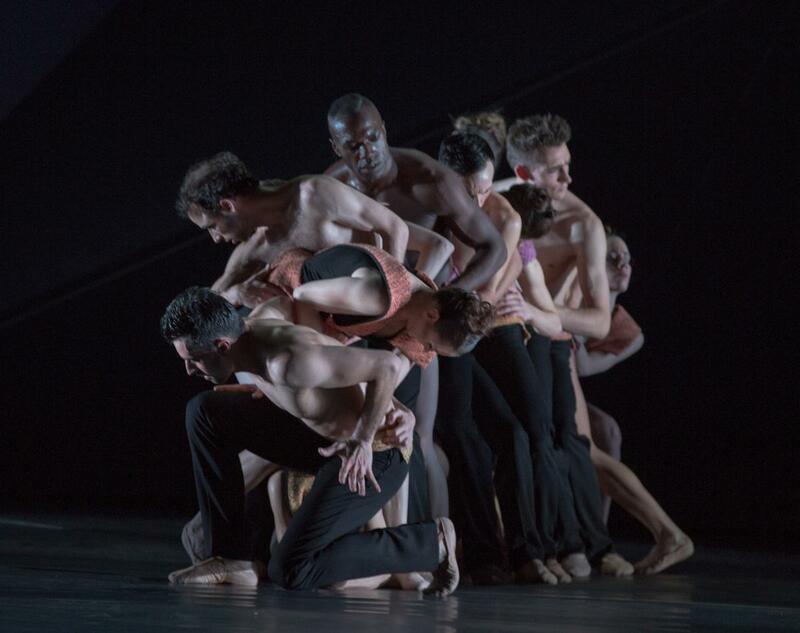 Often, dancers stood in place, barely stirring, repeating simple arm movements. The dance wasn’t elegant, but heavy. In the program booklet, Schläpfer described his idea as “a reversion to some sort of hibernation.”* Lasting for around three-quarters of an hour, “Roses of Shadow” feels lengthy. Accelerating the decay and shortening the piece would have heightened its effect. Set and costumes of “Roses of Shadow” were by Marcus Spyros Bertermann. He designed black tricots with sash-like decoration in brown, yellow, and purple for the women and black pants with waist scarfs in the same colors for the men. The set consisted of colored spotlights located on the left side of the stage, a huge diamond-shaped sculpture in the rear (its color shifted between different dark shades), and an almost invisible mini-platform at the left frontstage. At the conductor’s podium of Düsseldorf’s Symphonic Orchestra was Wen-Pin Chien. Marc Bouchkov played the violin in “Stravinsky Violin Concerto” and Wolfgang Wiechert was the pianist in “Polish Pieces”.